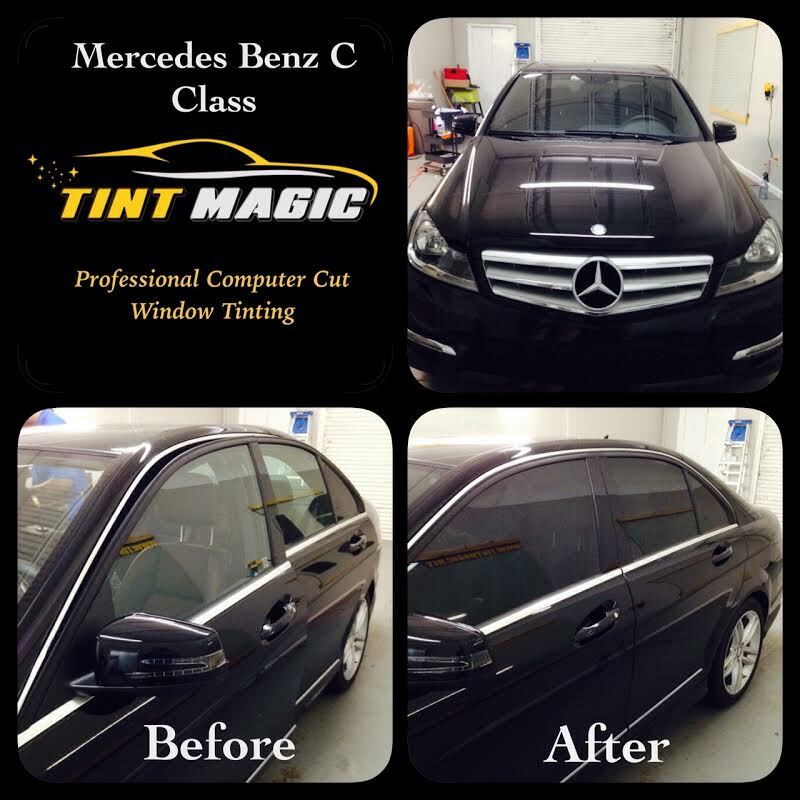 Mercedes Benz C Class Window Tinting at Tint Magic Coral Springs, before and after photos. Just adding window tinting to your car you can improve dramatically the apperance of showroom fresh automobile. Call us for a free estimate! 954-840-7883. The 2015 Mercedes-Benz C-Class is slightly larger, more luxurious, and more beautiful than ever before, ushering in a new era of design and equipment for the brand’s mainstream luxury sedan. From the look and feel to the dynamics and technology, the C-Class makes a strong argument for a position as class leader, making strides into territory once held by larger luxury sedans thanks to the entry of the CLA-Class sedan below it. The first thing you’re likely to notice about the 2015 C-Class is its striking exterior. You’d even be forgiven for mistaking it for the much larger and more expensive S-Class from a distance. But we like how the new C-Class doesn’t just ape the Mercedes flagship; it has its own profile, and its own details. Inside, the styling upgrade is even more apparent, and even more in line with the S-Class. Large round vents, a flowing center console, and inlaid metallic-look panels in the door all speak a design language that’s usually reserved for larger and more expensive cars. The 2015 C-Class launched in August, 2014, in just two forms, both coming with standard 4Matic all-wheel drive: the C300 and the C400. The smaller designation denotes a turbocharged 2.0-liter four-cylinder engine rated at 241 horsepower and 273 pound-feet of torque. The larger, the C400, gets a twin-turbocharged V-6 engine good for 329 horsepower and 354 pound-feet of torque. In the first quarter of 2015, a rear-drive version of the C300 became available; both diesel and hybrid versions are also expected to be offered in America eventually. All announced versions of the 2015 Mercedes-Benz C-Class in the U.S. use a seven-speed automatic transmission.